Earlier this week I told you that Jim Beam started making collectible decanters in 1952. 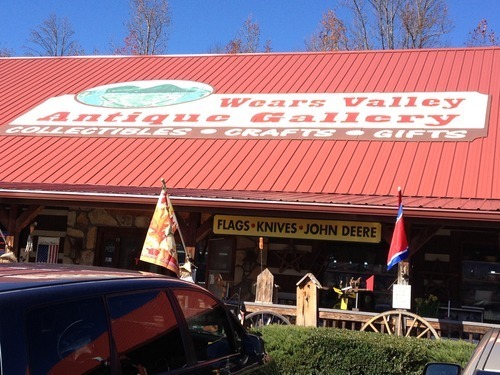 I was inspired to research that after stumbling across what might be the motherlode of Beam decanters in Wears Valley, Tenn., just outside of Pigeon Forge. The Wears Valley Antiques Gallery has an entire room of Beam decanters, all purchased from a gentleman in Tennesee whose collection of more than 1,600 decorative bottles was gathering dust in his garage. There are ceramic decanters shaped like historic figures, cowboys and bartenders; cut-glass decanters trimmed in 22-karat gold; and opalescent milk glass decanters. 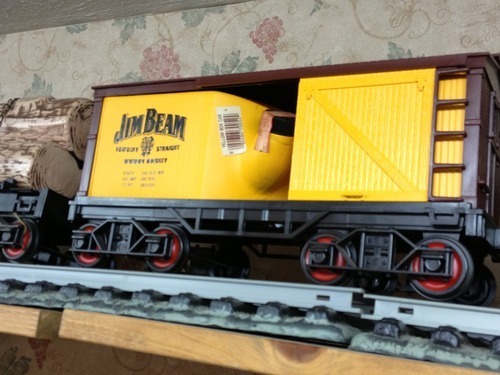 But the most impressive item in the collection is the Jim Beam train. This set from the late 1950s or early 1960s includes the train tracks, a water tower and 11 cars – all still full of whiskey. It can be yours for just $2,295.99. 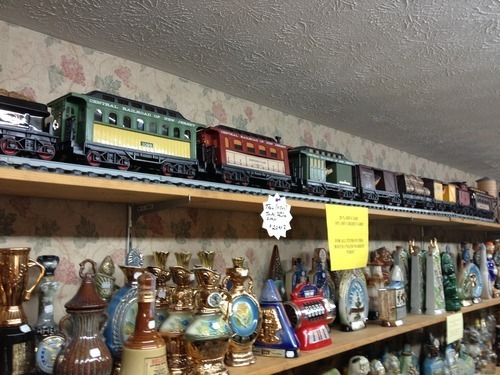 Or tell Santa this is the train set you’d like to see under the Christmas tree. Hi – I was hoping you could help me. I have four pieces of a Jim Beam train set. Each train decanter piece is full of Jim Beam whiskey bourbon and is bonded and sealed. They also come in original boxes. The first piece is a JB turner locomotive to counter, second piece is a Jim beam yellow box car, third piece is beams log car (Jersey & Western Railway) and the fourth piece is beams red caboose (New Jersey Central). There are four total decanters filled with bourbon whiskey that is bonded and sealed. I could show you pictures to show that seals on the decanters are not broken. They are filled with Jim Beam Kentucky Whiskey Bourbon. Can you help me with a valuation or do you know where I can get a valuation for it or possibly sell?